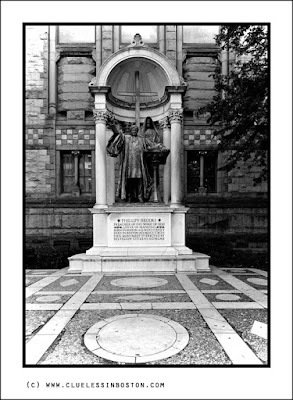 The statue viewed through the columns of yesterday's picture was Phillips Brooks, a noted Boston clergyman and rector of Trinity Church. Under his inspiration architect H. H. Richardson and muralist John La Farge and stained glass artists William Morris and Edward Burne Jones created an architectural masterpiece in Trinity Church. Lots of interesting small details in the photo when viewed large. One of those shots that would not work as well in colour. I agree with Jhon for the B&W. Morris and Jones, the two preraphaelit english artists? I love their work!With the perspective and lines, the statue (and the man) seem impressive! Such wonderful geometry in this shot. And I agree with the others, b&w is the right choice here. A very interesting post: thanks for the image and the valuable information. Oh wow, that's a beautiful statue, I enlarged it to see the details, love the expressions.